I have recently returned from my trip to Belgrade with Wizz Air. The outbound flight was was over an hour late. 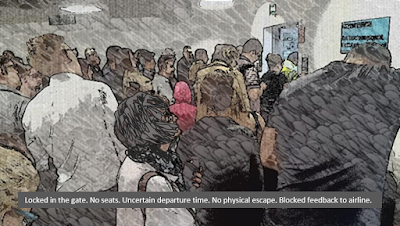 It was one of those surprise delays that you learn about only when you reach the airport and the delay starts getting longer as you get stuck in an overcrowded departure lounge and then standing squeezed in even more crowded boarding gate. Nobody explained the reason for the delay, nor how long we were expected to wait, which resulted in some passengers becoming agitated, children becoming restless and those less able to stand becoming very uncomfortable. The return flight to Luton went smoothly and arrived on-time. Understanding the uselessness of these types of surveys, I treat them as commercial spam. No exemption this time apart from a twist: sharing my feedback was only possible for the return (on time) flight with no space to comment on my overall travel experience, including the unpleasant delay of the outbound flight. It is obvious that this kind of feedback will never tell the system managers what they need to know, especially when things get much worse (as they often do). While these sorts of tricks can benefit marketing companies which conduct the surveys, ignorance about passenger experience during their critical travel segments only encourages operational dysfunction and comes costly for airlines.